This pattern is just like the one that appears on our best seller "Caribbean Sunset," but with all the designs on a smaller scale. 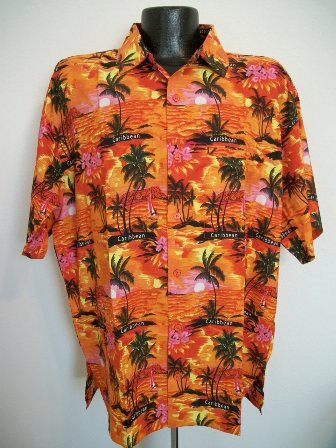 Everything about this shirt says Caribbean cool. This version of the shirt has the added feature of having the word "Caribbean" scattered throughout the pattern. Show off your love of this island paradise! Unlike the picture, THIS SHIRT DOES NOT HAVE PINK mixed in with the orange.